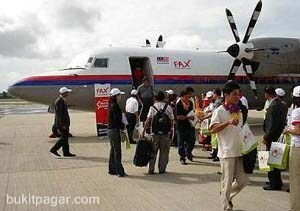 Fly Asian Xpress (FAX) is a subsidiary of Air Asia, currently the biggest discount airline in South-East Asia. FAX operates 22 routes within Eastern Malaysia (Sarawak and Sabah) using small Fokker 50 and Twin Otters aircraft, which enables them to land at smaller regional airports. FAX, with its headquarters in Miri, will connect all the rural sectors in Sarawak and Sabah with major cities and towns in the two states. At the start there was a two-week promotional fare of RM9.99 for all destinations in Sabah/ Sarawak. FAX will operate 343 flights this week. It will have its headquarters in Miri and will serve some 700,000 people throughout Sarawak and Sabah, particularly in the rural areas.